Ancient Aztec religion was a complex interaction of gods, dates, directions and colours. It seems that most of the preoccupation in the religion had to do with fear of the nature, and a fear of the end of the world. By the time the Mexica's Empire (Mexica is the proper name for the tribe at the heart of the Aztec empire) was at its height, the political and religions systems were in close interaction. The actions of the ruling classes and common people can be best understood if we look way back to the Mexica understanding of the creation, or rather creations, of the world. Because the religion was a mixture from various peoples, there are variations. We'll give a general overview here. According to ancient Aztec religion, it took the gods 5 tries to create the world. These attempts were foiled because of infighting among the gods themselves. After he was knocked from his exalted position by rivals, the first creator, Tezcatlipoca, turned into a jaguar and destroyed the world. Under similar circumstances, the world was created and then destroyed with wind, and then two floods. Each time a creator-god would take a turn being the sun. (Read more about the various Aztec sun gods here) Finally the gods had a council, and decided one of them would have to sacrifice himself to be the new sun. Nanauatl, a lowly, humble god became the sun, but there was a problem - he wasn't moving. The gods realized that they all must sacrifice themselves so that humans could live. The god Ehecatl sacrificed the others, and a mighty wind arose to move the sun at last. This was no free sacrifice, however. Not only would the people have to help this weak sun to keep moving, they would also be responsible to repay the sacrifice. The world remained in a precarious position! Once the sun was dealt with, the world had to be recreated. 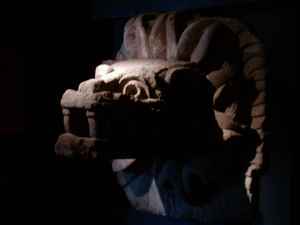 Quetzalcoatl (meaning feathered serpent) was the one who would create humans. Of course, people had been created several times before, so Quetzalcoatl descended into the underworld to retrieve their bones. He tripped as he fled, and the bones shattered into different sized pieces, which is why people are all different sizes. By adding his own blood to the mix, people came to life. For another variation and more detail, see the Aztec creation story here. The ancient Aztec religion was highly focused on keeping nature in balance. One false step could lead to natural disaster. The weak sun could stop moving. In the sky was a constant battle between light and darkness, a battle that would someday be lost. Huitzilopochtli (Hummingbird of the South) was the warrior sun (either the sun god or the one who fights for the sun god, Tonatiuh (the name given to Nanauatl)). Huitzilopochtli (or Tonatiuh) needed blood sacrifice in order to win the battle against darkness. Either there would be ritual blood-letting, or actual people would be sacrificed. Those sacrificed would rise to fight with him. And so human sacrifices became more and more common in Mexico. Often battles would be fought just to capture prisoners to sacrifice - the Aztec flower war (or Aztec flowery war). Every 52 years, the people were terrified that the world would end. All religious fires were extinguished, people all over the empire would destroy their furniture and precious belongings and go into mourning. When the constellation of the Pleiades appeared, the people would be assured that they were safe for another 52 years. The world in ancient Aztec religion was divided up into 4 quadrants, and the center - their city Tenochtitlán. The heavens were divided into 13 ascending layers, and the underworld 9 descending layers. The heavens and underworld may be better described as wheels within wheels, a more common form for the Aztecs than layers or lines. 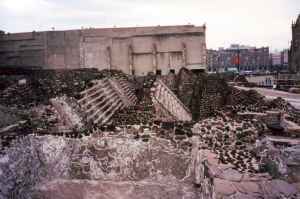 The temple in Tenochtitlán was also the place where the forces of heaven and earth intersected. Prophecies were a part of the ancient Aztec religion. Many scholars today believe that the Aztec people thought that the conquerer Hernan Cortes was their god-hero Quetzalcoatl, who had been banished. Whether or not the more educated upper class shared this belief is questionable. The afterlife of a person was based mostly on how they died. Some, such as those sacrificed to Huitzilopochtli, would join the battle against the darkness. In ancient Aztec religion, some would eventually be reincarnated as birds or butterflies, or eventually humans. Some would be, for a time, disembodied spirits roaming the earth. Most at some point would have to make the long journey through the 9 levels of the underworld. People would be buried in a squatting position, with items that would help them in their journey. In the end they would live in darkness. Ancient Aztec religion was focused on how the gods, humans and nature were interconnected. There was a strong emphasis on the worship of Huitzilopochtli. The military conquest and ritual sacrifices were all related, and in a great part focused on helping Huitzilopochtli keep the sun strong so that disaster could be averted every 52 years.